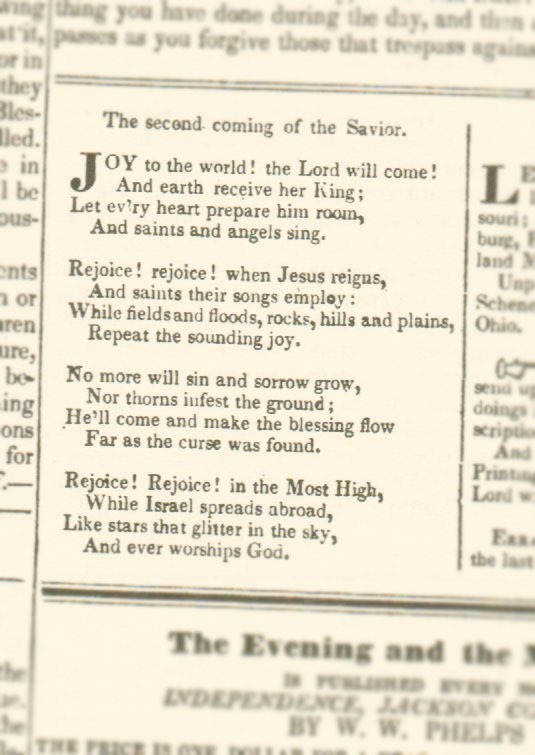 180 Years Ago: Joy To The World, The Lord Will Come! Each month, I feature an extended summary of an article, story, or document of interest that was published 180 years ago that same month in a Mormon periodical. Last month’s entry, representing November 1832, is found here: 180 Years Ago: The Shepherd of Israel and the Tribe of Joseph. 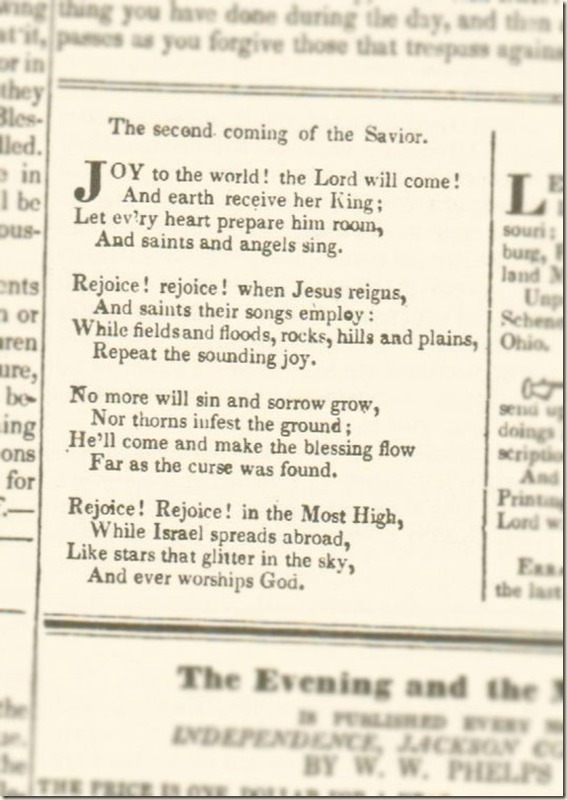 This hymn is W. W. Phelps’ revision of Isaac Watts’ original classic “Joy To The World”. Originally rejoicing in the Second Coming of the Lord rather than the now-traditional association with the Nativity, Phelps’ revisions make this hymn even more explicitly millennial, and relevant to the Latter-day Saint community. With the odd exception of a reversion of the first two lines of the first verse to Watts’ original, Phelps’ revision has remained the de-facto version found in the official Hymnbook, and sung and known by modern Latter-day Saints. And heaven and nature sing. Joy to the world! the Lord will come! And saints and angels sing. Repeat the sounding joy. Rejoice! rejoice! when Jesus reigns! Far as the curse was found. This entry was posted in Art, Documents, History and tagged Christmas, eschatology, hymnody, music by David Tayman. Bookmark the permalink. Phelps’s revisions are interesting because they seem to reflect a somewhat overzealous application of Mormon theological sensibilities. Technically I don’t think there’s anything preventing Latter-day Saints from using Watts’s version, since the Saints do believe in the first advent of Jesus and the present rule of God over creation. However, Phelps appears to have been concerned that Watt’s poem reflected a realized eschatology. In Phelps’s version, Jesus doesn’t yet truly reign over the world, except perhaps in a limited sense. The world is awry and apostate, and the nations decidedly do not prove God’s glory or righteousness, as in the last stanza of Watts’s version. Phelps’s erasure of this stanza wipes out any hint of Calvinist providentialism, erases any whiff of affirmation that the present world may be the way God intended it to be. The age of meticulous providential governance of the earth, in Phelps’s view, is still to come. Thanks, Chris. And great analysis. Even though I’ve been LDS for nearly 9 years now, I still have to make special effort to make sure I remember to sing ‘saints and angels’ when singing with other Latter-day Saints! Phelps, in much of his writing, due to his role as editor of the only official and authorized publication of the Church, appears to have taken it upon himself to be the one to clear up and resolve what he saw as misunderstandings with the general world’s eschatological view. It’s fun to see Phelps’ interests, concerns, and perspectives chronologically play out side by side with those of Rigdon. One of those things you don’t think about often. Thanks for the reminder. Fascinating post. I looked on the online LDS hymnal. Joy to the World is attributed to Phelps, but is the first hymn in the Christmas section of hymns. It appears that the church wants to keep this as a Christmas carol (first verse following Wesley), but also wants to keep Phelps’ escatologocal meaning in the second verse. That makes the most sense of the textual changes. Any thoughts? The hymnal’s first verse doesn’t follow Wesley’s completely. It keeps Phelps’ “saints and angels” combination. I think by Wesley you mean Watts? And that’s right – it’s the first two lines of the first verse that were reverted. I’m actually interested as to when the reversion first took place, whether it was early, or relatively late – anyone particularly familiar with LDS hymnody there to shed some light? Yes, Watts. I saw Wesley in Mark’s comment and typed it by accident. I would check to see what the hymnal from the ’40s had. The 1948 hymnal had “Joy to the world! the Lord will come! And earth receive her King”. So, the change back to “is come” came in 1985. I just checked the Russian edition that came out in 2005 (just in time for my mission), the tense in the first verse is closer to Phelps’ version than the 1985 revision. What’s interesting about Phelps’ millenialist version is that it captures the spirit of Advent: the preparation for Christ’s coming, both the first and last.